Even though most people think there isn’t anything better than a raging bull market, bull markets have some disadvantages as well. At the time of writing this, we have had a strong bull market for almost a decade. Therefore, most people have gotten used to this bull market and its traits. Due to this, even relatively small 1% down-moves scare many investors because they just aren’t used to this anymore. Such an attitude can be dangerous and risky. In the following article, I want to discuss some of the disadvantages and risks of long and strong bull markets. Most stocks follow the overall market. Therefore, in bull markets, most standalone stocks tend to increase in value together with the overall market. In other words, predicting stock price rises in bull markets is much easier than in other markets. The problem is that many people don’t know this. They think their trading ‘skill’ is responsible for their gains instead of the overall market. Even though their skill/trading strategies often don’t actually have anything to do with their gains. If the overall market would change to let’s say a bear market, they probably wouldn’t make any money at all. Bull markets, therefore, often teach traders/investors wrong lessons and create bad habits. Often certain people enjoy a lot of success in bull markets. Some of these people try to help others achieve similar success. Due to this many of these so-called ‘trading educators’ teach bad trading strategies that only work because of a bull market. Most of these strategies probably wouldn’t work in bear markets. It is much easier to make money in bull markets than in bear markets. A good trading strategy should work in all markets. The problem with a very long bull market (like the one we had the previous decade) is that people never experienced anything else than constant price rises. Thus, most people would have no idea what to do if the overall market (and with it most other stocks) would turn around. A great example for this is Bitcoin. Bitcoin and cryptocurrencies, in general, were by far the hottest asset (asset class) in 2017. Bitcoin’s and most other cryptocurrency’s price did do almost nothing but rise in 2017. Due to the crazy price increases, many people enjoyed crazy returns. Especially, the people that bought Bitcoin when it still was quite low and held on to it, enjoyed the biggest (paper) profits. The problem here is that many of these people thought that their crazy (paper) returns came from actual skill. Some even created online (paid) courses to teach others their ‘skills’. Most of these people didn’t actually have a trading plan or strategy. They simply got lucky. That’s also the reason why many of these people had no idea how to react when Bitcoin’s and other cryptocurrency’s prices began to fall. Immediately, their made up ‘trading plans/strategies’ stopped working. Constant price increases teach wrong lessons and can’t prepare you for potential reversals. 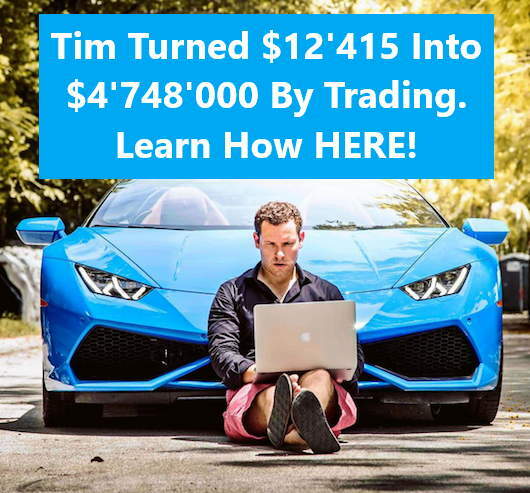 Before signing up to any paid trading courses, try to make sure that the trading educator has been able to make money both in bull and bear markets. Otherwise, his strategy potentially won’t actually work if prices don’t just rise uninterrupted. A further disadvantage of steady bull markets is the lack of volatility. Traders crave volatility. Many good traders don’t really care too much about the direction of the overall market as long as there is enough volatility. Sadly, volatility usually is relatively low in steady bull markets. Therefore, a lot of traders don’t necessarily like steady bull markets. You can’t really trade very good when the market just keeps going up by a few points every day. Passive investors, however, love bull markets. All you have to do is buy and hold. A good two-sided market is best for most traders. It allows you to make money on (relatively short-term) moves up and on moves down. For example, many options traders (including me) like to sell options. Options tend to be more expensive in times of high volatility. But volatility mostly is very low in steady bull markets (like we had in recent years). Therefore, it can be very hard to find good, expensive options to sell. The following chart is a chart from the VIX (CBOE’s Volatility Index). It measures the expected volatility in the S&P 500. 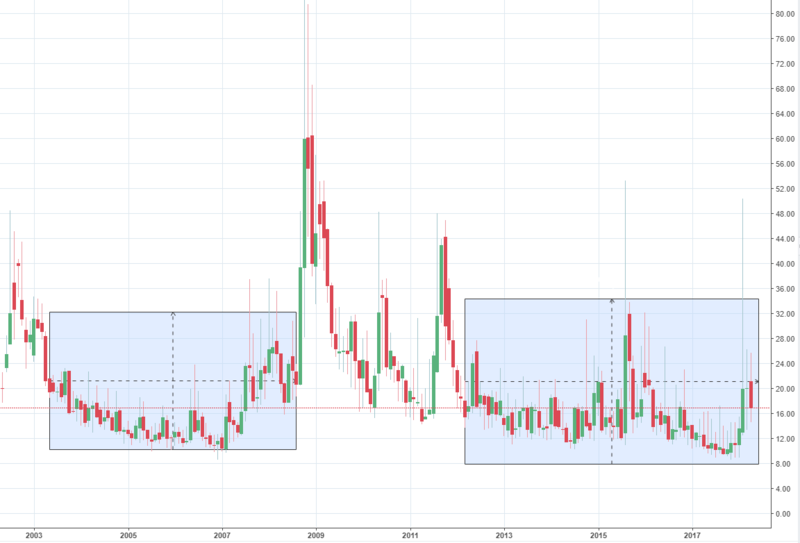 On the chart, I marked two different times when the VIX (so the volatility) was very low for quite a long time. The first time is between 2003 and 2008. The second time is between 2012 and 2018. The next chart is an outtake of SPY’s price history. SPY is an ETF tracking the S&P 500. I marked the same time frames on this chart as I did on the VIX chart. Unsurprisingly, the S&P 500 was experiencing a very solid bull-market during these times of low volatility. This should make it quite clear that the volatility mostly is low during steady bull-markets. Generally, very long, steady and nonvolatile bull markets can make trading boring. Passive investors that buy and hold certain assets for years like these markets a lot. But even these investors often become blinded by the constant up-moves. They often forget that times have been and will be different. Thus many passive investors forget to take profits and act all surprised when the overall market begins to shift direction. Remember, buying and holding forever is not a strategy. The next problem of strong and long bull markets is the increase in risk. The further something rises, the harder it can fall back down again. The same goes for the markets. The more prices increase, the more they can decrease again. A $30 asset can only decrease in price by $30. A $200 asset, however, can drop by $200. Therefore, the $200 asset theoretically carries more risk with it than the $30 asset. Back in 2000 and 2008 (the last two market crashes/bear markets), there was a lot less downside risk than we currently have. 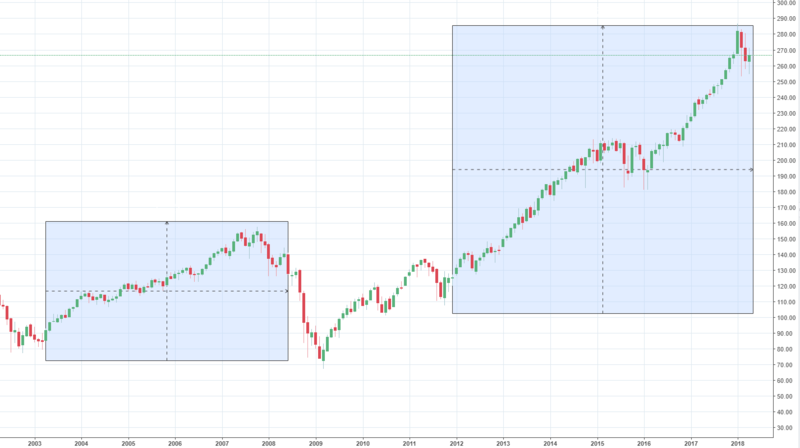 Before the crashes, the S&P 500 (SPX) was trading around $1500 and it dropped down under $700. That’s more than a 50% drop. A similar drop occurred in most other major indices (DIA: 50% drop, QQQ: 50% drop…). Currently, SPX has almost traded as high as $2900. That is about $1500 of additional downside risk compared to 2008. As I mentioned before, most stocks follow the overall market. If you look at single assets during the 2000 or 2008 crisis, you can see very similar price action as you can see on the overall market. Apple, Microsoft, Bank of America, Goldman Sachs, BMW… just to name a few! All of these had huge drops in the years of the 2008 crisis. Even though companies like Microsoft (or Apple, BMW…) didn’t have anything specific to do with the crisis of 2008, their stock price still plummeted from $37 to $15. This is because most stocks follow the overall market! The same will be the case for the next bear market. It won’t only affect a few stocks, it will affect almost all of them. Summed up, the more prices increase, the more they can drop. We have had an incredible run-up over the past (almost) ten years. The steepness of the run-up has increased more and more over the years. For example, in 2017 the SPX had solely green months except for two minor red months. This is a sign of a very one-sided market. But in the past few months something changed. Instead of the usual steady, seemingly never-ending up-moves, we had two very solid red months. This has freaked out many investors and traders. Most people just aren’t used to down-moves anymore. It is important to understand that prices can’t just move up without interruptions. There always will be pullbacks, consolidations and bear markets. This is unavoidable. I am not saying that we are currently entering a bear market (I’m not saying that we aren’t entering a bear market either). All I am saying is that the level of price increases that we have been experiencing over the course of the past year(s) aren’t sustainable. 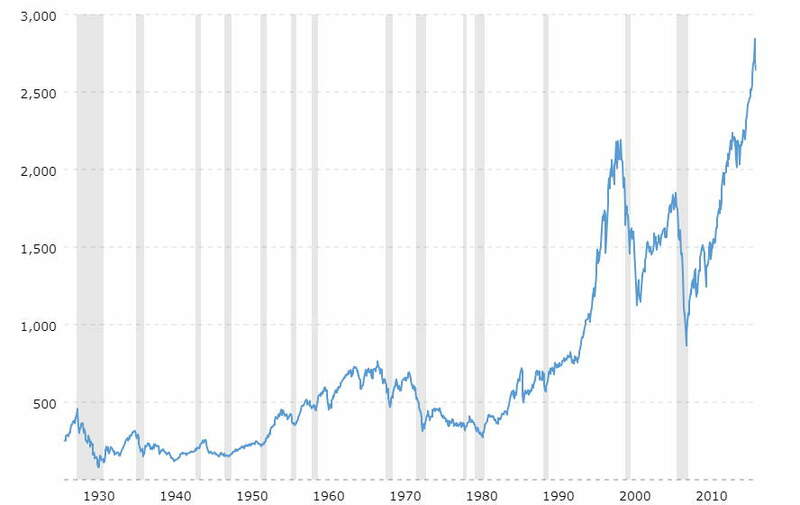 The following chart is a 90-year historical chart of the S&P 500 Index (SPX). The light grey marked areas are times of recessions. As you can see, our current run-up is very steep and probably not sustainable without a pullback. We have experienced/are experiencing (one of) the longest bull markets in history. This means that a reversal is getting more and more likely. So don’t expect prices to continue to increase forever because frankly, they won’t. Even after the current price drops, we are still up a ton. There is a lot more downside risk. Please be aware of this. The diagram below shows the performance of the S&P 500 Index between the years 1928 and 2018. 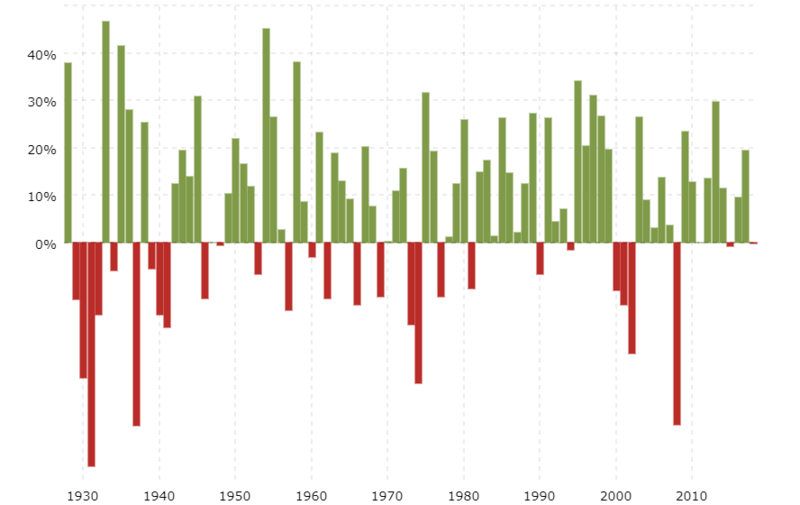 The red bars mark times of negative returns (so bear-markets/recessions). As you can see, we haven’t had a major red-bar in quite some time. This diagram can give the impression that it is about time to experience a pullback. If you are interested in more of the above long-term charts and diagrams, you could check out macrotrends.net. Bull markets can only be active for a limited amount of time, not forever. Don’t forget that. We haven’t had a substantial down-move, pullback or reversal for a very long time and therefore, most people don’t know how to react when this happens. Please don’t misunderstand me. I am not trying to predict the next market crash or anything of that kind. 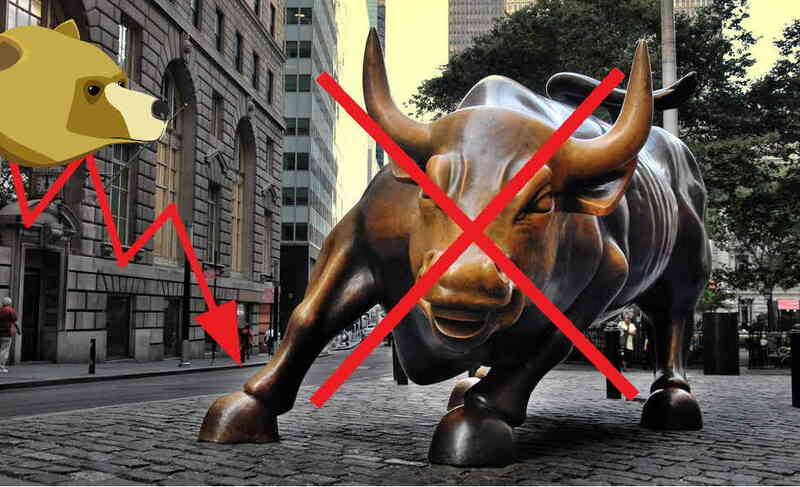 I am simply trying to make people aware that bull markets have their disadvantages and can’t go on forever. Prices can’t increase forever! So don’t be surprised when they stop going up. Furthermore, bull markets often teach the wrong lessons and promote bad habits. Remember just because someone has made a lot of money in bull markets, does not mean that he is a good trader. Most of their strategies will stop working if prices stop to go up all the time. These bull market geniuses aren’t actually that smart. In addition to that, bull markets aren’t ideal for most traders as volatility can be very limited. Even though I ranted about bull markets in this article, they aren’t only bad. Bull markets obviously have advantages as well. I just wrote this article to show some of the disadvantages and to make people aware of the risks connected to long, steady bull markets. Hopefully, you enjoyed the article and learned something new. I would love to hear your thoughts about bull markets in the comment section below. Do you agree with me or did I miss something? This Short review is just a way of informing people about the cons of bull markets. People do not really care as far as they make money and it is cool for them. A turn around in most of these is very risky. The article is a must read for others. As for me I feel warned and informed for the future, so thanks. Thanks for the feedback. Glad you enjoyed the article. I love the photo! That’s Ave Diagonal Of Barcelona! and the cheeky bear overlooking the bull! Would I guess right that you prefer bear markets? I understand the concerns with both bull and bear markets, it is in my humble opinion that the best trading strategy is the tried and trusted “coffee can” strategy! serious long term holding of assets, minimum of 5 to 10 years. All the rises and falls tend to even out and give steady overall rise over time. Thanks so much for sharing your thoughts! Buying and holding for long periods of time is definitely a good strategy. I wouldn’t say that I always prefer bear markets over bull markets. I just like volatile (range-bound) markets. Bear markets often have this which is nice. Hi Louis, great article and points, as always…. Finger crossed to all of you guys! Very good article. It’s balanced and puts things in perspective nicely. Thank you Louis. I am learning so much from your course… And I really appreciate your integrity! It’s awesome to hear that you enjoy my content. I appreciate the positive feedback!